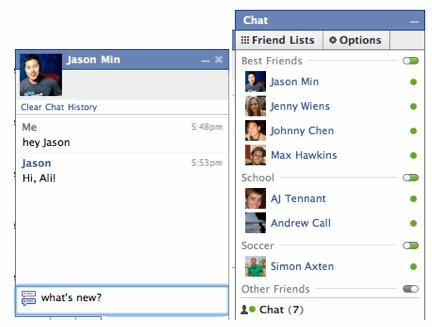 Chat is Facebooks name for its instant messaging system. You can engage in real time conversation with any of your Facebook friends who happen to be online and signed in at the same time as you are. The Facebook Chat box is on the lower right side of the interface and contains a small green dot next to Chat. Clicking it will open the chat box and show a green dot next to the name of friends who happen to be signed into Facebook at that time.Facebook Chat has a gear icon with settings you can change to determine who can see that youre online and when.